Ultra-high resolution sampling of this ice core (~120 μm, allowing ~550 measurements within the year dated ~1300 C.E.) was produced using the Climate Change Institute’s (CCI at the University of Maine) W. M. Keck Laser Ice Facility laser ablation inductively coupled plasma mass spectrometer (LA-ICP-MS) [Sneed et al., 2015]. This new method allowed us to count highly thinned annual layers previously not detectable by conventional cm-resolution analyses. It turns out that lead has been poisoning Europe for at least 2,000 years, with one notable exception: the few years during and after the Black Death. Apparently the plague killed off all the lead miners, and for a period of a decade or two ambient lead levels plummeted to low levels. 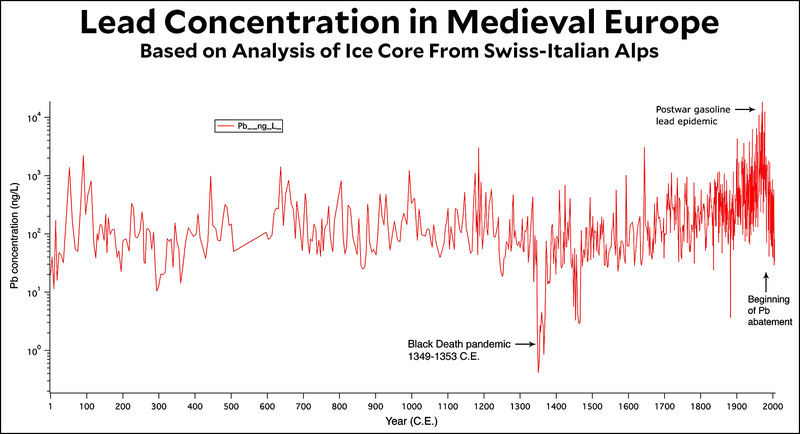 One theory that has been advanced is that the devastation in Florence caused by the Black Death, which hit Europe between 1348 and 1350, resulted in a shift in the world view of people in 14th-century Italy. Italy was particularly badly hit by the plague, and it has been speculated that the resulting familiarity with death caused thinkers to dwell more on their lives on Earth, rather than on spirituality and the afterlife. It has also been argued that the Black Death prompted a new wave of piety, manifested in the sponsorship of religious works of art. Oh please. Maybe it caused scholars to think more about their lives on earth. Wait, no. Maybe it made them more pious. This is just post-hoc folderol. Here’s my theory: Lead levels plummeted from about 1350-1370, and children born during those years entered adulthood around 1370-1390. I propose that they were smarter and more focused than your average medieval scholar,¹ and this extra IQ boost from the plague is the real origin of the Renaissance. Generation P gave it enough of a kickstart that it then kept going of its own accord even after lead concentrations returned to their previous levels. As you can see from the chart, we have curbed the disastrous lead levels of the late 20th century² and are now down to the levels of about 1700 or so. But we still have a ways to go if we want to kick off a new renaissance of our own. Glory awaits us if we’d only spend a few billion dollars to get rid of lead once and for all. ¹Also less likely to pursue a life of crime, presumably.